Although I’ve always been a member of the quiet minority when it comes to this, I’ve still never hesitated to make my opinion known on the subject the annual summer church festival. In the Cincinnati area, there are something like a godecajillion (that’s a rough estimate) Roman Catholics, and it often seems like there’s a church for every 10 of us. And every last one of them has some form of festival through the course of the summer and/or fall. They’re pretty German in concept, typically, with plenty of beer, music, unregulated carny games and rides sausage -style meats, and a general sense of Gemutlichkeit*. And while that seems like something a fellow like me would appreciate, as it turns out, I can’t stand the things. At any rate, this past weekend our parish had its yearly festival, which I find myself duty-bound to attend each August. You know, because while the Puddinette might let my festival curmudgeonness roll for the rest of the summer, she’s as like to drive me to the middle of nowhere and leave me with nothing but a hunk of moldering cheese and a bottle of ranch dressing as let the kids miss out on festival fun at our own church. However, this year, I finally, FINALLY found something redeeming about these church festivals that everyone else seems to love so much: doughnuts. Lest you be a bit confused, I’m not talking about your standard dozen from that guy that’s all, you know, “Time to make the donuts.” No, no, no. 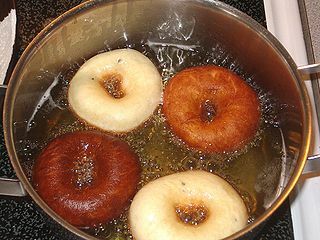 I mean, slightly warm and somehow crispy/crunchy yet soft and cloud-like in the middle like the-most-perfect-little-slightly-sweet-hunk-of-fried-dough-ever-shoved-gleefully-in-someone’s-cakehole doughnuts. Here’s the thing: when I was younger, I loved me some doughnuts. I couldn’t get enough blueberry cakes or chocolate or carmel-iced things. As a adult, though, I seem to have reached a point where I’m decidedly meh about the things. Truth is, most of the doughnuts I’ve purchased in the last few years left my mouth covered with a slick, greasy feeling, and I swear I could taste the, um, “processing”. It’s gotten to the point where that pink and white box kind of turns my stomach (no, not the one the lacey underthings come in). Thankfully, at last, the annual church festival has restored my faith (see what I did there?) in the glory of fried bits of sweet dough. I mean, I mentioned that they were warm and soft and covered in just the right amount of cinnamon sugar or powered sugar, right? I might have just drooled on my shirt. Barring confirmation of that from a secondary source, though, I’m going to deny it. So, am I in love with the annual parish summer festival now? Goodness, no. I still feel like I had my wallet extracted by a industrial crane that didn’t even bother to buy me dinner or ply me with alcohol. But the holy doughnuts did make the experience somewhat less painful, and at least I’ll have something to look forward to this time next year. ‹ PreviousWell, THAT was easy!